John DeStafeno, MD is a board-certified ophthalmologist specializing in all aspects of refractive cataract surgery and laser surgery as well as the treatment of complex corneal diseases. 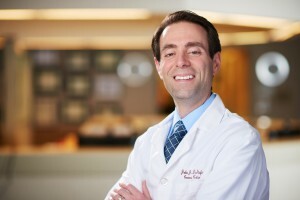 He completed his 2-year fellowship at Duke University which focused on clinical research and the medical and surgical management of anterior segment disease. Dr. DeStafeno has brought several innovative medical and surgical treatments to our area and is an experienced all-laser LASIK surgeon. In addition, Dr. DeStafeno was the first surgeon in Chester County to perform DSAEK corneal transplantation. Recognized both locally and nationally for his excellence in eye care, Dr. DeStafeno has received numerous Top Doctor and Surgeon Awards. For the past several years, he has been selected by peers to instruct the LASIK Surgery Course at the annual American Academy of Ophthalmology meeting. Dr. DeStafeno also enjoys educating the future of eye care, instructing ophthalmology residents at Wills Eye Hospital at Thomas Jefferson.